Let’s talk about s-e- …(wait for it)… ctionals! Many people would never think to put a sectional sofa into a tiny home. They’re way too big! Tiny homes need tiny furniture. Don’t they? But I have come to believe that tiny furniture in a tiny home is not necessarily the way to go. In fact, we found that all those small pieces made our place look even more cluttered and tiny. It occurred to us that fewer pieces, more functional and with bigger presence, were much more suitable for our little apartment. So we decided to go whole-hog and get a sectional. Hey, if you’re going to go big, do it like you mean it. We began looking at a lot of furniture stores, websites, and Pinterest posts… Sectionals are expensive! But even if we’d had an unlimited budget, we couldn’t find anything that fit our vision. The problem was that we wanted it all. First and foremost, it had to have a cool, mid-century look. It had to provide lots of storage. And it had to convert to a bed for guests. My friends, this turned out to be the Loch Ness Monster of furnishings. It simply didn’t exist. So we designed and built our own. We came up with a multi-functional piece, which is always a good thing in tiny spaces. 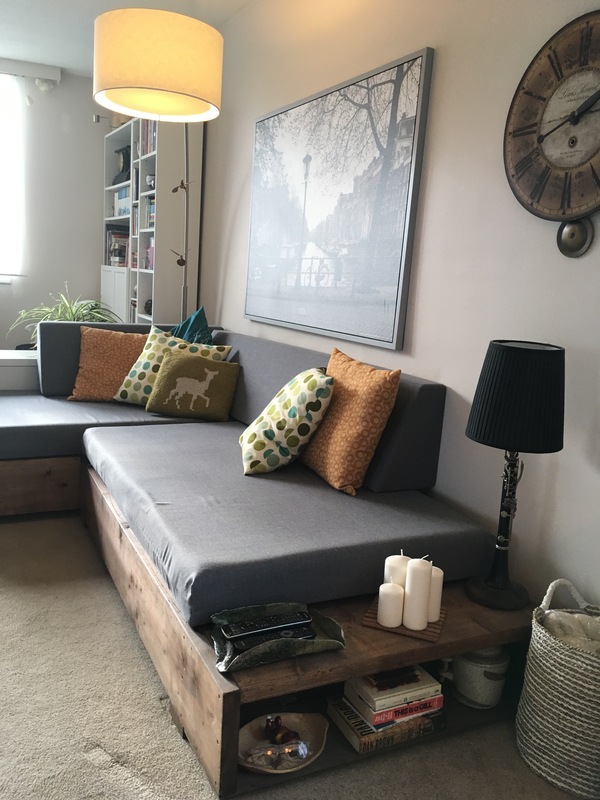 In addition to offering way more seating than we had before, the two separate pieces can be put together to make a guest bed that’s approximately queen sized. 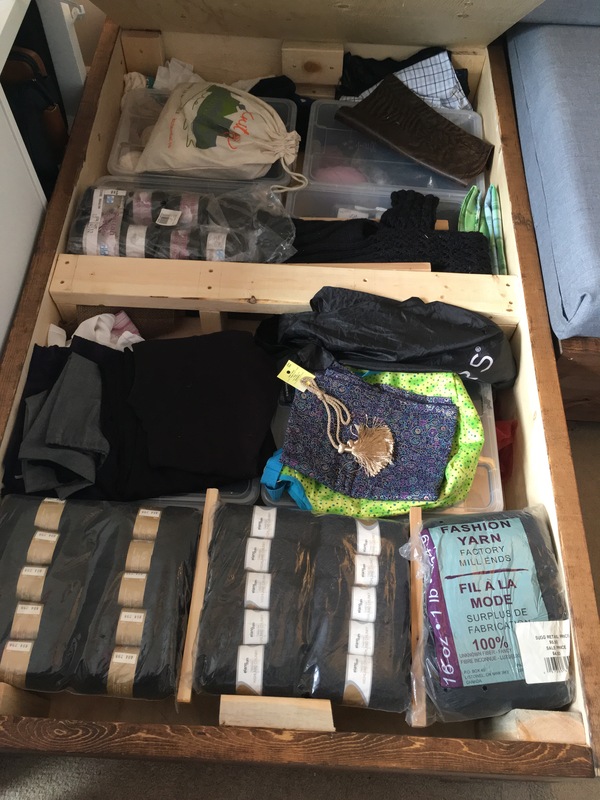 Also, each piece is a storage box: one for linens and bedding; and one for my collection of yarn (I’m an avid knitter and a hopeless yarn junkie. There. It’s out. Don’t judge). We built the sectional quite low, so that it doesn’t feel massive and overpowering. Low furniture gives the feeling of higher ceilings and openness. We got foam for the bolsters from Vancouver Foam Store (http://vancouverfoam.com/). One piece is 3′ long, the other is 6′. For the seat cushions, because of our limited budget, I found that the most economical option was to buy a queen sized foam mattress from Walmart, 4″ thick with a layer of memory foam, and cut the pieces to size (3′ x 5′ each). For the upholstery covers, I bought some fabulous wool suiting at Dressew on Hastings (https://www.facebook.com/dressew/) – a place I frequently buy fabric from because the prices are so great. I made them zippered so that they can be removed and cleaned. We decided to make the cushions a neutral charcoal grey. Sounds boring, doesn’t it? But if you stick to a neutral colour for the sofa itself, you can always add pops of colour in the toss pillows or a throw. Choosing a neutral base also keeps the piece from taking over the room. You want it to have big presence without taking up all the visual space. What makes a big piece work in a small space? Keep it low. And keep it neutral. Done right, it will act as an anchor for everything else in the room. All the lumber was purchased at Home Depot. We used 2 x 10s and plywood, and had all the pieces cut to size so all we had to do was take it home and put it together. We kept the design as simple as possible, because we’re just not that skilled at woodwork. The sectional is basically made up of two rectangular boxes. 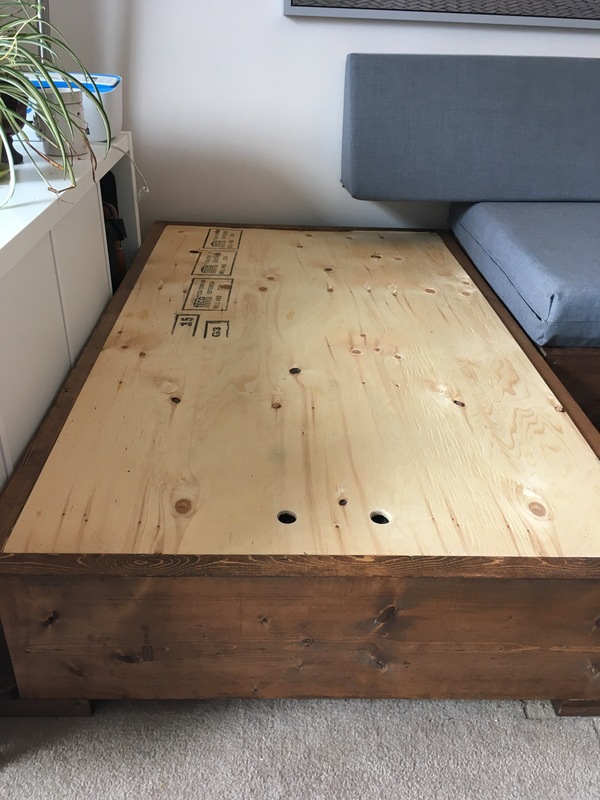 We made one of the boxes about 10 inches longer than the other, making the long end an attached side table/shelf/cubby thing where we keep our TV remotes, coasters, and a couple of books. The feet are made up of 2x10s cut into 5″ x 5″ pieces. We attached low profile plastic furniture sliders so they could be moved with relative ease. Once assembled, we stained the wood a dark walnut colour. The sectional has transformed and anchored our tiny space. It makes our anniversary lamp work, while before the sectional, the lamp looked enormous, out of place and downright weird. The sectional has big presence, but it doesn’t overwhelm. It invites. 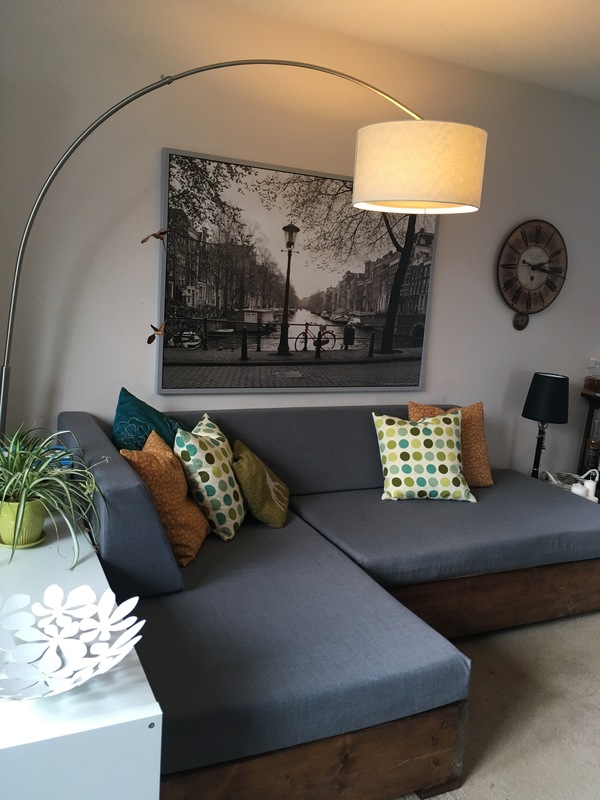 It demands big art (our giant Amsterdam print), complements big accents (the anniversary lamp), and it practically begs you to sprawl out and get comfy. How to live large in a small space? Start with one big, multi-functional piece of furniture and build from there. Avoid clutter at all costs, and that means if you have a collection of small furnishings doing the job of one large piece, get rid of it! Sell it, pay it forward, whatever you need to do. And if you can’t find that one great piece of furniture that will solve all your problems, make one yourself! Simply Brilliant! I’m the type of person who is always looking for ways to “get more out of your space.” Finding ways to have more room and functionality have always been a top priority for me. I rearrange furniture many times until I find the most functional/eye pleasing arrangement. I have always fancied a fold away bed which would leave a multi-functional open space for yoga/meditation or what ever you choose. Good work! Love it! Just moved to a small apartment myself so I look forward to seeing what is in store and to get some ideas! Another great idea. Going low and neutral is smart, as is using all furniture pieces for multipurpose requirements.